Do you remember…Morton’s Department Store? Some of you might remember that before Walmart and other big box stores were the norm, you’d buy your clothes at department stores. 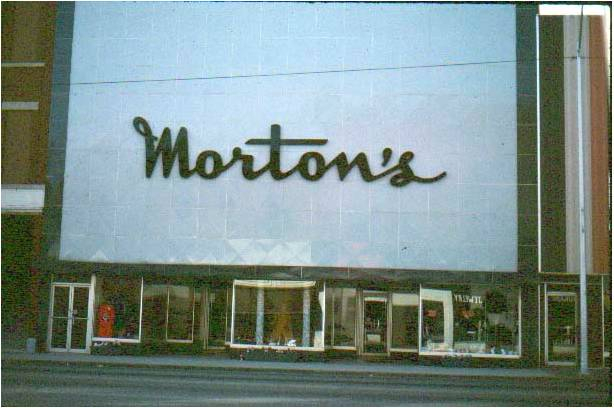 In Sapulpa, Morton’s was one of the most patronized and personalized available. Before the era of big box stores and Walmart, people bought their clothing at department stores. You could go into the store and a clerk would assist you in finding the latest fashions and the brands sold were American–made. These brands included Haggar, Van Heusen, Dickies, Botany 500, Stetson, Maidenform, Bobbie Brooks, Florsheim, Nunn-Bush, Hush Puppies, Bostonian, Campus, H.I.S., and PF Flyers, to name a few. You could buy perfume such as Chanel no. 5 or White Shoulders, men’s cologne, such as Canoe and Brut. One could find almost any type of clothing and accessories such as purses, handkerchiefs, hats, and scarves. Morton’s Department Store at 124 West Dewey offered personalized service, the latest and finest fashions, and offered a revolving charge account for the convenience of their customers. When you walked in, the clerks greeted you by name and you felt like you were part of a family, a far cry from shopping big box stores today. Morton’s was started by Sam Sheffel, a Ukrainian immigrant, who, with his wife Lena, came to Sapulpa from Kiev, Ukraine. He opened the store in 1932 for his son Morton Sheffel, who had recently graduated from the University of Pennsylvania’s Wharton School of Business (which is the alma mater of our current POTUS). The store had two entrances which were inset from the store display windows. The entrance to the door on the right had mosaic tiles embedded in the concrete and spelled out Morton’s name. The downstairs displayed women’s clothes, accessories, perfume, and most of the men’s and women’s shoes. (Some of the men’s shoes were sold upstairs.) The sales counter was a four-sided desk that was located in front of the stairs which led up to the men’s and boy’s clothing department. The men’s department was managed by Delmar Sharp, who had already retired from J. C. Penny. He was quite knowledgeable about men’s and boy’s clothing and kept the men’s department pristine and well-stocked. The women’s section was managed by Betty Edwards, who, at one time was their buyer. Dottie Knight was the lead sales lady. Several other clerks worked both the men’s and women’s sections. In the back of the downstairs, was the office for Morton’s father, Sam Sheffel, who had closed his retail enterprises and needed an office for his other business ventures. Sam’s assistant was Laura Woodruff, a single mother whom Sam had hired during an era when single mothers had a tough time finding decent employment. Laura was his valuable aide for many years and also helped with various duties at the department store. When I was in high school, I worked for Morton Sheffel as a janitor/stocker/maintenance man. The enticement to leave working for my father was that I was offered the opportunity to purchase clothing at cost plus 10 %. This was an offer I could not refuse since I was able to buy snappy young men’s brands such as H.I.S., Campus, and Hush Puppies for far less than I could buy them anywhere else. My mother had instilled in me the virtue of dressing well and buying quality clothes that would last. To this day, I have followed her advice. Sam Sheffel(left) and Morton Sheffel in the office of Morton’s department store. One experience in particular, while working in the capacity of Mr. Fix-It, stands out from the rest. I was changing an overhead porcelain light bulb socket. I turned the breaker off and instructed the sales staff that the dressing rooms would be dark for a while, and to NOT turn the breaker back on. I was on a ladder attaching the hot wire to the new socket when I felt a massive jolt of electricity and was knocked off the ladder. One of the clerks had turned the breaker back on. ARRRGGG! Morton Sheffel died in 1980. His son, David, and wife, Dorothy ran the store until they closed it in 2001. My parents, Merlie and Charlie Betzler, and I shopped there for years. I miss the days of such personal service and feeling like the owner and employees were friends and family. Morton’s Department Store will always be some of my fondest shopping and youthful employment memories. I wish to thank David Sheffel for graciously allowing me to interview him and providing a photo of his grandfather and father. ← Local artisan extraordinaire: Brandon Mull does more than tattoos…a lot more.